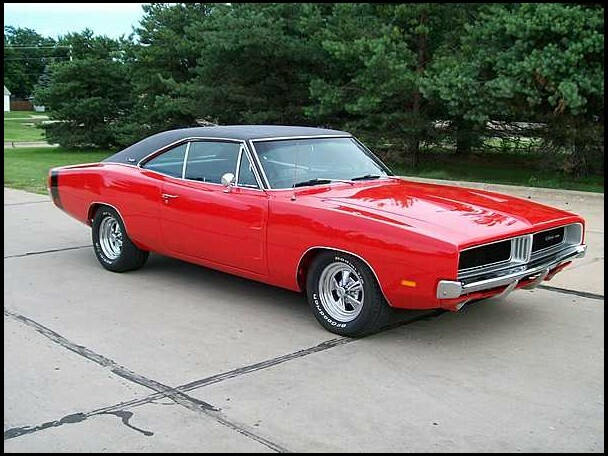 The introduction of the Dodge Charger in 1966 was a success for Dodge, so in 1967 it received minor improvements. The most obvious was the elimination of its full length interior console that gave it seating for only 4 people. Getting in and out of the rear seat was the “big” complaint that Dodge chose to deal with. With the optional front seat flip down armrest the Charger could actually seat 6 now. The exterior now received the Coronets new side indents as well and front fender indicators for the turn signals mounted on the leading edge of the fenders. The 426 Hemi was added to the option list during the “66” run and continued to be an option. It added $712 to the Chargers base price of $3128. Due to the steep price only 117 were ordered with the Hemi. The 361 was eliminated and in its place the 383 was offered and new to the engine choices as well was the new 440. 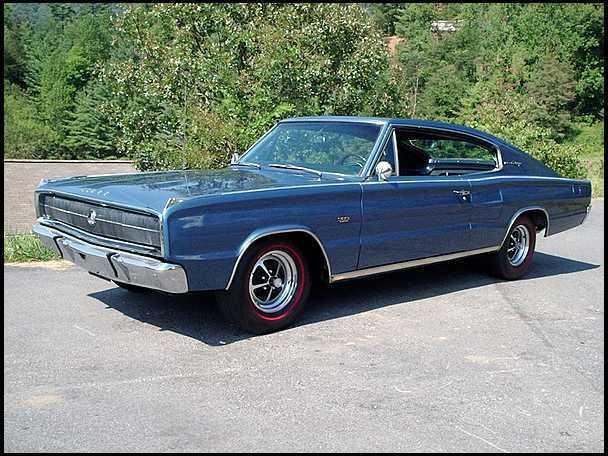 Having sold 37,300 Chargers in 1966, the 1967 model was a disappointment as far as sales and only 15,788 were produced. Clearly the similarity with the AMC Marlin as well as the Chargers overall “puffed up styling” was not winning over the “Performance Crowd”. Restyling was in order for 1968. The Coronet continued with minor changes including the aforementioned side indents. The executives at Chrysler decided that other than the Charger they would limit the availability of the “Street Hemi 426”. The official stance was the Hemi would only be available in the “Letter-Series” vehicles. 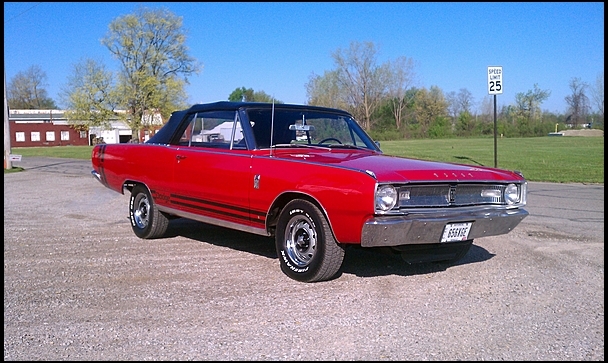 That meant the R/T series package for the Coronet. Despite this there were several Coronet Deluxe built with the factory installed Hemi engine as well as at least 1 Coronet 440, 1 Coronet 500 and 55 Super Stock Drag vehicles known as WO23 models. The 440 and 500 designation were merely trim level packages and had nothing to do with engine choices. Some people believe since the 440 was an available engine choice that 440 models came with that engine but such was not the case. The top engine for Coronet was to be the 383 unless the R/T package was ordered, but this was ignored in most cases and many Coronets received the larger engine. An interesting fact on Dodge and Plymouth vehicles was their use of “fender tags” to indicate options used on their vehicles. While Ford and GM only listed basic info on theirs Mopar would routinely use 2 or 3 added tags for “loaded” vehicles that help make them the easiest to authenticate even today. 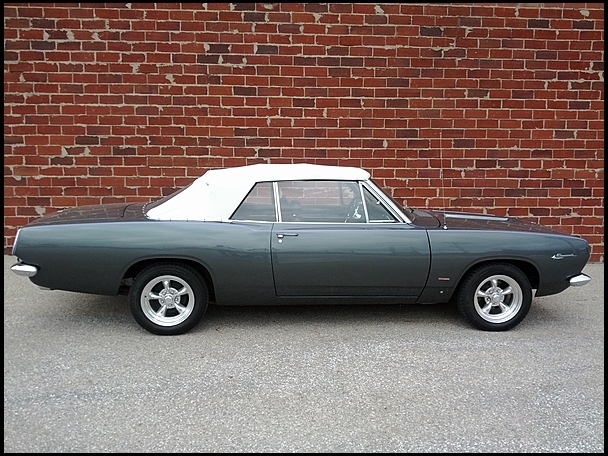 The styling department did a total makeover for the Dodge Dart for 1967. Now its 4th makeover since the model first came into being, the Dart had gone from Full-size to compact and now into the Pony Car segment. Standard engine was the 170 slant 6 or optional 225 slant 6 engine. V8 choices were the 273 small block or if you ordered the GT or GTS you could get the 340 or even the 383 in the model. The Dart saw an increase in production from 112,900 in 1966 to 154,500 for 1967. 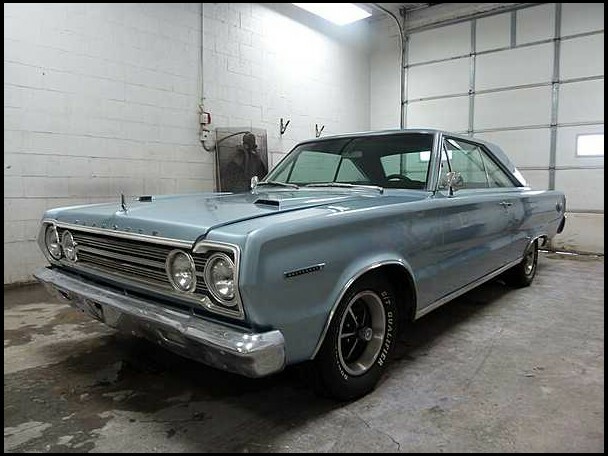 At Plymouth they had the same engine restrictions on their Belvedere model as Dodge did on the Coronet. Their Valiant was restyled since it was the “corporate clone” to the Dart. Sales for the Belvedere/Satellite fell from 189,752 in 1966 to 148,080 in 1967. Similar to the Coronets fall from 250,900 in 1966 to 184,200 in 1967. Plymouth still managed to outsell Dodge as far as cars by over 210,000 vehicles. 636,893 compared to 410,088. The Plymouth Barracuda got restyled and sales went from 38,029 in 1966 to 62,534 in 1967. 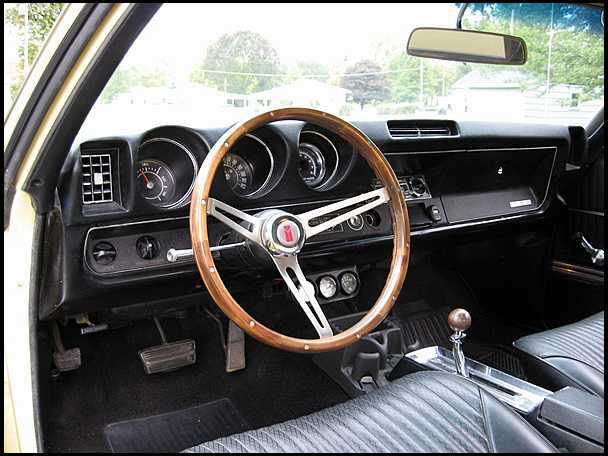 The Barracuda was standard with a slant 6 cylinder engine but options included the 273 as well as the 340 and even the 383 with the right option package. The “Fish” was clearly trying to take aim at the Mustang but by 1967 there was no way any “Pony Car” was taking the top seller title from the Mustang. After all Mustang alone counted for 472,121 units built and sold for Ford in 1967. The introduction of the GTO in 1964 had caused enough of a stir in the hallowed halls of General Motors that John Z. DeLorean was promoted to being the head of Pontiac division in 1965. And nothing creates more of a nervous climate than a hot-shot in the midst of “Corporate America”. 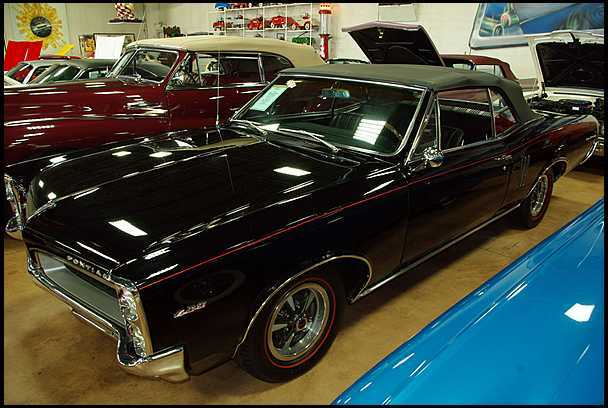 Starting in 1966 every division in GM was copying the formula that had been used to make the GTO a hot commodity. I am referring to the “Tri-Power” setup involving using 3 dual barrel carburetors. The standard for Detroit during the 1960’s was to freshen sheet metal every 2 to 3 years and complete redesigns every 5 years or so. The GTO got reskinned for 1966, mainly in the rear sections but the biggest news was it got its own body designation instead of being an option on the Tempest/LeMans platform. It was still on the same platform but now was a stand-alone model- not just an option. 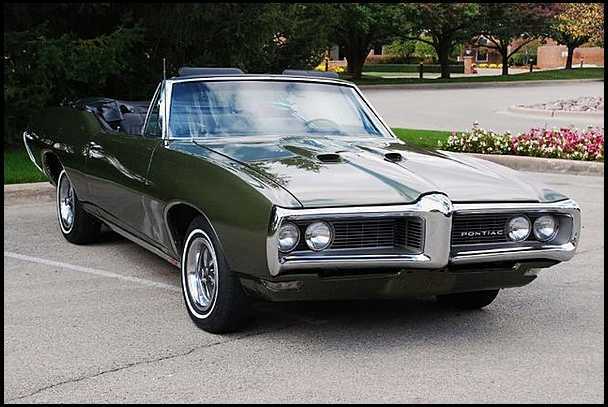 The Goat was now a cultural icon and the most visible GTO was the “Monkeemobile” seen on television by every kid in America on a weekly basis. 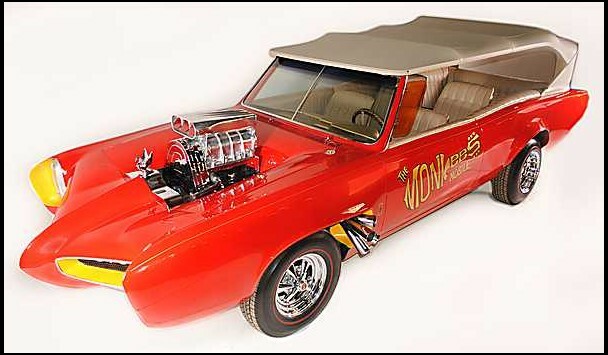 While not a stock appearing vehicle thanks to George Barris who created it…there were styling cues left in it to distinguish that it was indeed a Pontiac. And in the vein of “customs” for the 1960’s it had the obligatory blower intake which made the impression of being a dragster. Oldsmobile now had a tripower option for their 442 model. The average buyer for Oldsmobile was not as mechanically inclined as other GM buyers and they did not sell many with the multi-carb setup but it was available. The multiple carburetors added a claimed 20 horsepower, although that was considered modest as most car magazines figured it was somewhere closer to around 40 or more. The biggest news from the staid folks over at Oldsmobile was the introduction of the new Oldsmobile Toronado. It was marketed as a personal luxury coupe but with its fastback styling it was definitely meant to draw attention from the performance crowd. 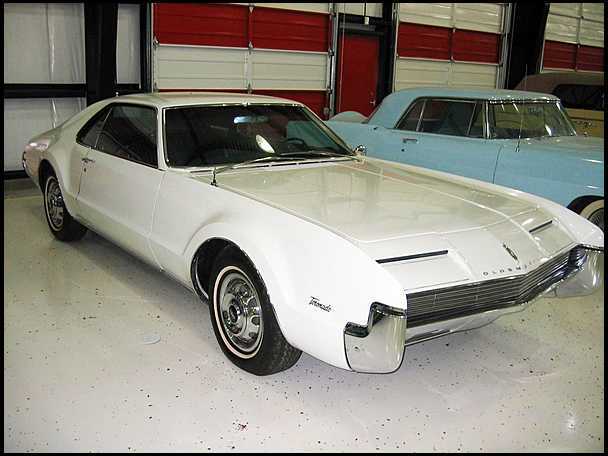 The Toronado had been in developement for over 2 years due to the fact that it was a front-wheel drive car and Oldsmobile wanted to be sure they had a workable system for it. 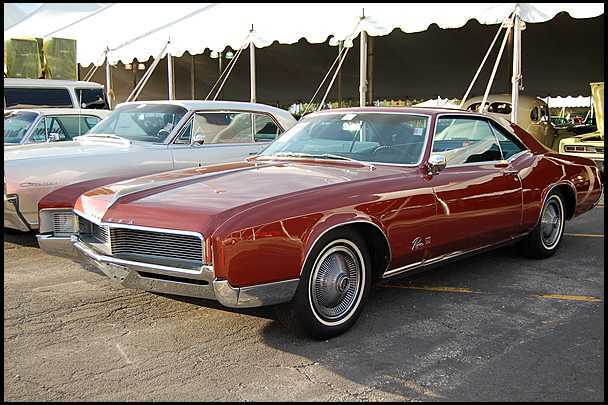 The big gain from the developement of the Toronado was the transmission. It was the now legendary TH400. The automatic transmission could handle more torque and higher horsepower than any previous design from General Motors and would become a valuable piece going forward with the “Muscle Car”. The Buick Riviera for 1966 was based on the same body style as it’s Toronado cousin but retained a conventional rear wheel drive layout. At the time it was believed to be the longest hood on a production car. I do not believe they were comparing it outside of the 1966 model year since the 1920’s and 1930’s Deusenbergs would have the record with their straight 12 cylinder motors. The Buick Skylark shown here and the GS400 that was based on it remained mostly unchanged although like the 442, Buick saw fit to make fender vents a styling clue. 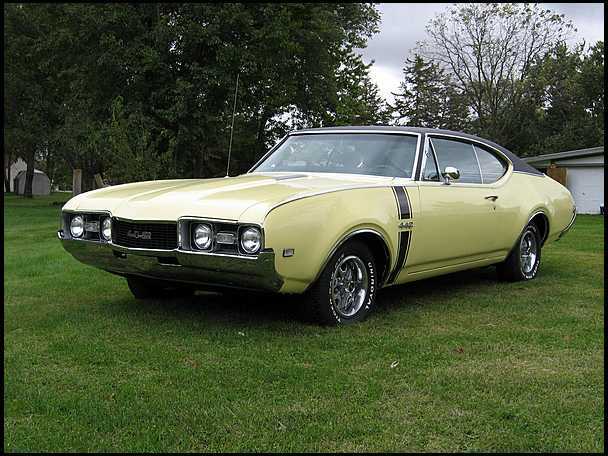 Both the Oldsmobile 442 and the Buick Skylark had styling that was similar with its division’s full size vehicles. Because of this there were plans to change the body designs for the following model year. 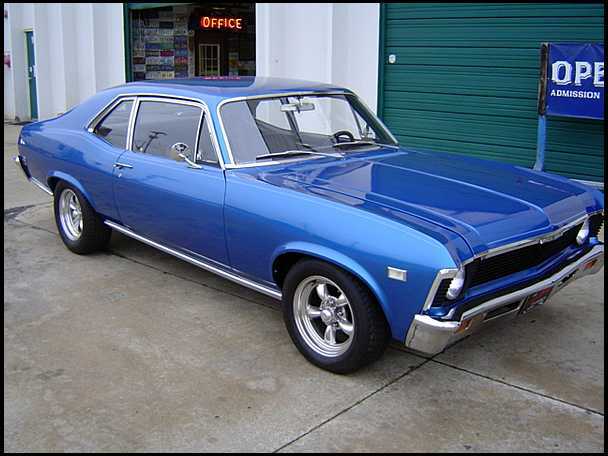 Over at Chevrolet they were still building the Chevy II/Nova model but were realizing that it’s 327 was just not enough for the competition of the “Muscle Cars” even though it was a compact car, Chevrolet wanted it to be a competitor. So plans were underway to remold the model in line with the other intermediate vehicles while remaining in the compact class. 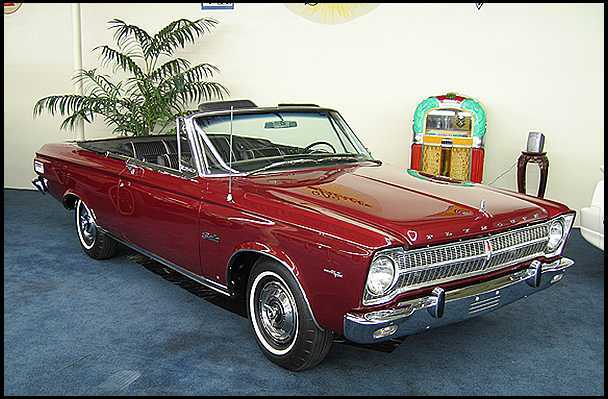 They wanted a direct competitor for the Ford Mustang and the Plymouth Barracuda and to a lesser degree the Dodge Dart. This was where the Muscle Car segment was headed in Chevrolet’s opinion. If America had accepted the mid-size cars with full-size power, then it reasoned that smaller cars would be even more in demand. The Chevelle SS396 and the entire Chevelle line got new sheet metal for 1966. 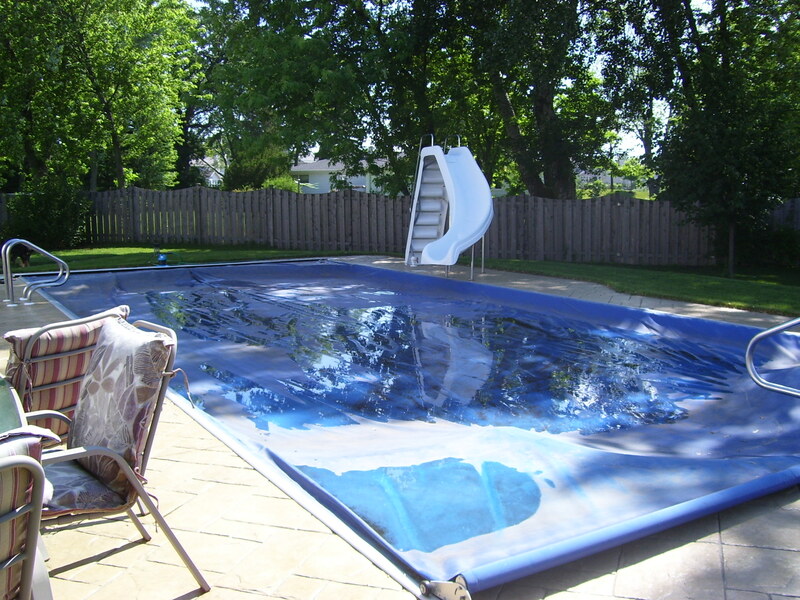 The sides were more rounded and the roof became more slanted in the rear. Overall it was one of the best looking midsize vehicles you could buy in 1966. 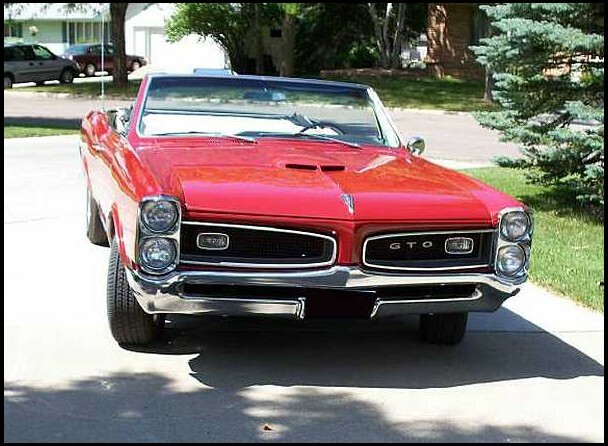 While my opinion is just that- an opinion, only the GTO looked better as far as the GM vehicles in 1966. 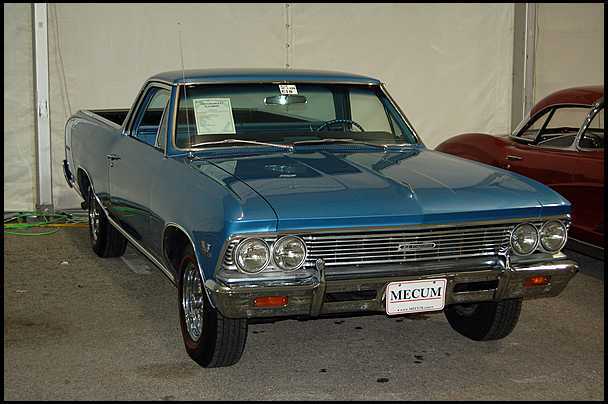 One of the by products of the Chevelle was the El Camino, which took on the Chevelle body design and also its option list for 1966. It was now in the Muscle Car crowd as it could be had with the SS396 option like this one here. The truck market now had options to join in the fun. While the El Camino couldn’t haul what a real truck could and it was not a real workhorse, it gave the market a new option for a Utility Muscle Car. During the 1966 model year, nervous GM executives again tried to slow down the upstart junior executives by decreeing that only the Chevrolet Corvette would be allowed to have a multi-carb option as of the 1967 model year. Next up the Ford answer….in the next post. Back to the timeline for the Muscle Car Era. 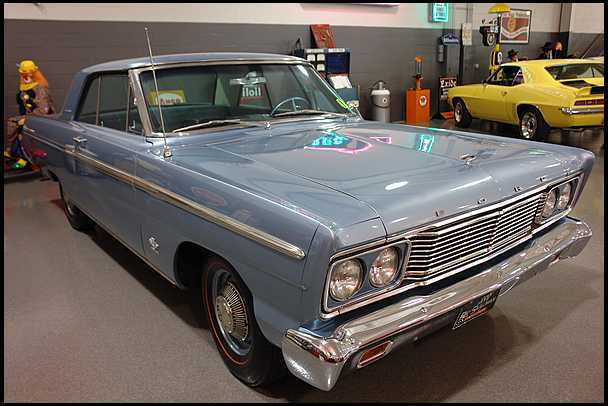 1965 saw the redesign of the Ford Fairlane. Despite the previous years Thunderbolt model, the bigwigs at Ford were slow to react to the Muscle Car challenge over at General Motors. 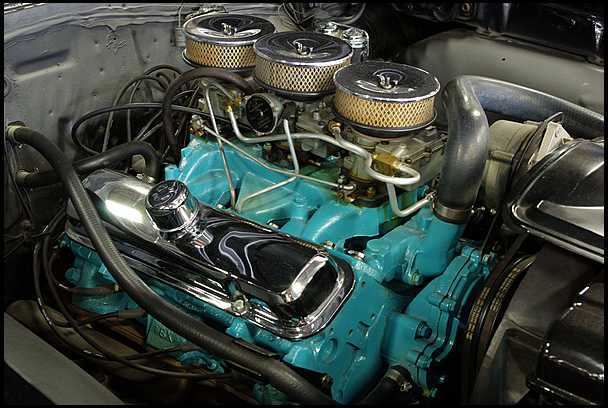 The top engine for the Fairlane remained a 289 small block. Although it was a high performance version it was still a small block. While I do not claim to be psychic, my opinion is that Ford had enough success going on with the introduction of the Mustang and the Ford Galaxie was still the top dog on the NASCAR circuit. They had won more races in NASCAR than their competition, but that was due to General Motors corporate ban on racing as much as anything. 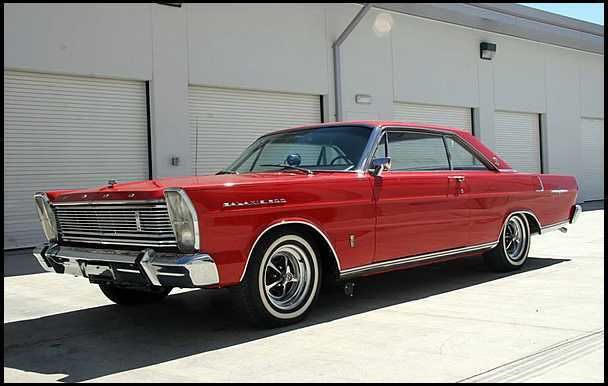 Their 427 powered Galaxie was responsible for 23 wins in 1963, and 30 wins in 1964. Ford had developed a new version of the 427 to counter the threat of the Mopar camp’s Hemi engine. It was what is known as the “cammer” engine. It used a hemi-style head configuration to develop even more power and had dual chain drives to run dual overhead camshafts. Despite what Ford felt was a reply to the now legendary Hemi that Dodge and Plymouth were using, NASCAR banned the engine from use. Ford protested since the reason NASCAR balked at the motor was that it was not a production engine. After all, Mopar (Dodge and Playmouth) had been using the 426 Hemi even though it was never made available in any production car. The result was that to be fair, NASCAR banned the Hemi as well. Mopar promptly pulled out of NASCAR for the 1965 season and told all factory sponsored teams not to race. To make a long story short attendance was down and interest waned so much that NASCAR relented and late July the Mopars returned to the track. The damage was done and the Galaxie 427 ended up winning 48 out of the 55 races for the year. The 1965 Galaxie 500 with a 427 R-code is pictured here. While GM sat on the sidelines again at the race tracks of America, Ford was capitalizing where they could. 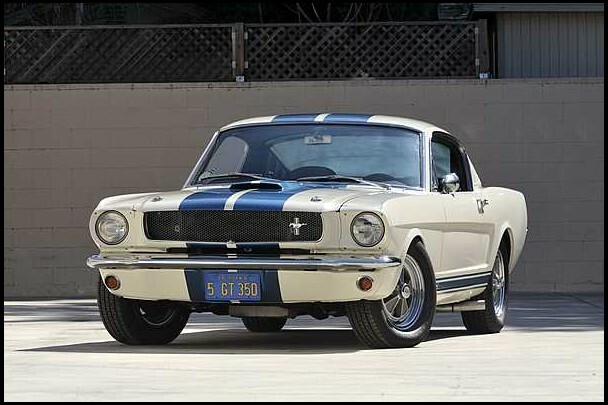 They had Carroll Shelby building enhanced versions of the Mustang to sell to the public. Shelby had made a name in racing as a driver and an engineer, but his first claim to fame was taking the English AC Cobra and putting the 289 engine in it for racing. His reasoning was that a reliable high performance American engine in the lightweight English bodied car was the secret to winning. And by all accounts he was correct. By 1965 he was making a version of the Cobra with the 427 as well. The Cobra was dominant as one would expect. 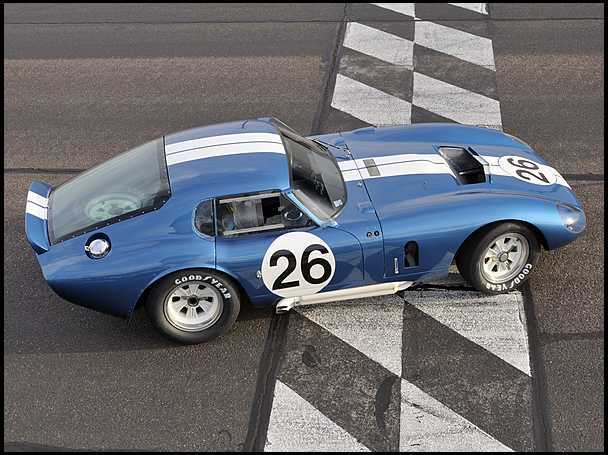 Shelby and Ford set their sights on the endurance races for 1965 and the Shelby Daytona Coupe was created. It is not a Muscle Car because it was not a factory production car, even though Shelby Motors could be considered a manufacturer. The reason it is included here is that this particular Daytona Coupe set the record for the highest price paid for an American car when it sold for $7,250,000. That is 7 and a quarter million dollars. 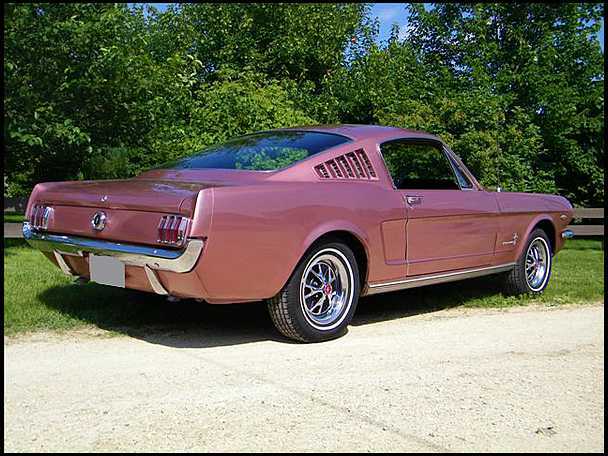 This is a 1965 Ford Mustang production Fastback 2+2 in a rare “Coral” color. Here is a 1965 Shelby 350 with the 289 High Performance engine. Shelby used additional upgrades to get even more power out of the 289 than the factory did. After all if you paid extra for the car, buyers wanted more. 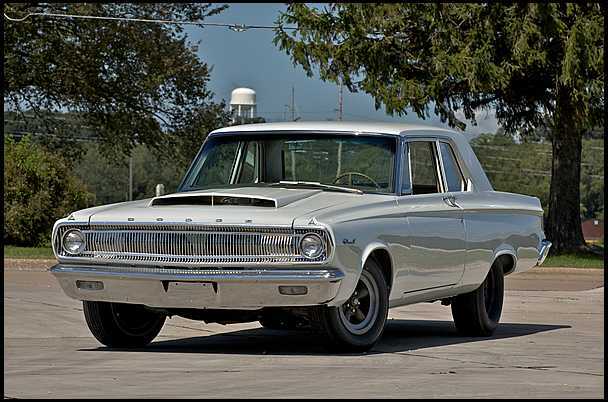 This rarely seen beauty….is a 1965 AMC Rambler Marlin with its 327 cubic inch engine. You don’t find a lot of these around, as they were not big sellers and they were not on par with most of Detroit’s Muscle Cars. But they do show that even AMC was starting to pay attention to what the performance market wanted. 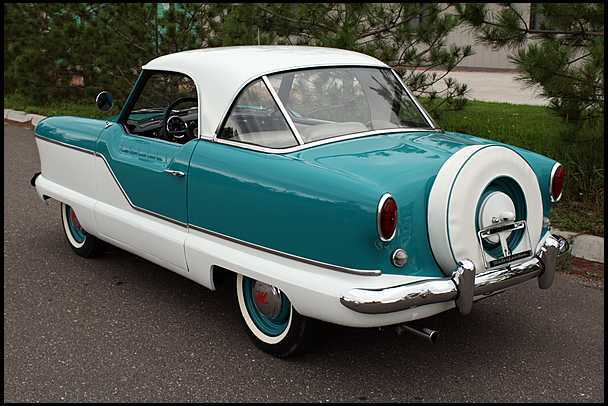 After all AMC; or Rambler as they were known; was known for their boxy little economy cars. The Marlin has been given credit for being the first “hatchback” ever made. This one needs a paint job I would think. The Marlin also had another first….it had front disc brakes as standard equipment. A safety feature that all automobiles would have to have in the years ahead. 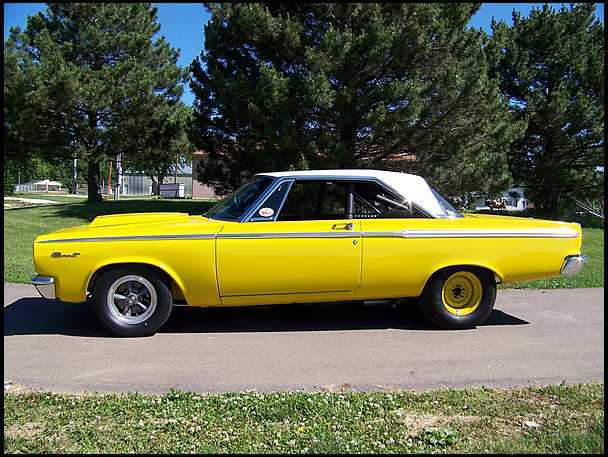 Dodge redesigned the Coronet for 1965 and the yellow beauty here has the 440 CID engine. But the beast in the Muscle Car wars for 1965 was the Coronet with the 426 “Wedge” motor. The engine did not like to idle and was not very suitable for everyday street use. It was probably the thirstiest engine ever produced and getting 10 MPG meant you were probably driving in neutral down a steep hill. But the Hemi version of the 426 was up to now only a racing engine because of the expense to build it. That would change as the year went on and even the hemi engine became available in several models at Dodge. At Plymouth the “sister” car to the Coronet was the Satellite and it was also available with the “Wedge” and later the Hemi. Most of the Hemi powered vehicles that were produced in 1965 were actually converted by dealers who saw the potential for the performance market, and the resulting profit. Anybody who has ever been in the New Car business will tell you that sales is not what drives a “Dealership”… it is the Service Department that pays the bills and makes the profit. Even in 1965 you could buy the same car at another dealer so pricing was very cut-throat. 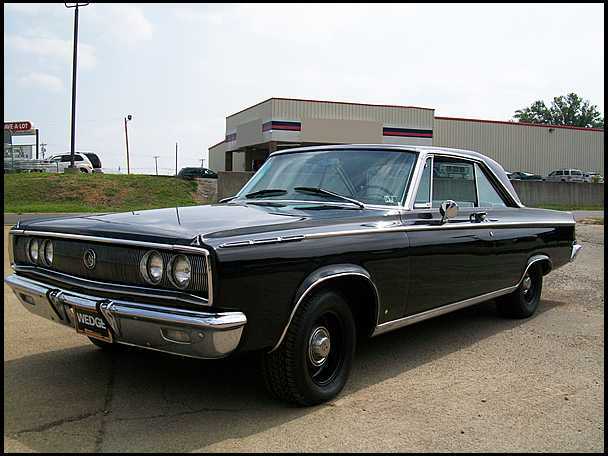 The 1965 Dodge Coronet also saw the model known as the 990. This was a factory built race car just like what Ford had done with it’s Thunderbolt project earlier. The difference was this had the Hemi 426 and was also available in an altered wheelbase which moved the rear axle several inches forward in the body for the drag strip. It was one of the reasons why “wheelie-bars” are used on drag cars as the rear bumper would actually drag on the pavement when the vehicle launched if you did not back off the throttle to keep the front end on the ground. So while 1965 may not have added much to the building Muscle Car Era it did set the stage for what would be coming as the Detroit automakers ratcheted up the street performance game. So stay tuned for more on the next post. Although not unprecedented, I am leading off with a photo that is not a car although, as I will explain is car related….kind of. Photo credits to HRC/WENN via Wonder Wall for the picture. It is John Mellencamp with his wife Elaine. After 20 years they have decided to split and while it is sad, I hope the split works out for the better. Having went through a divorce myself, I can testify that it doesn’t have to be a mess and sometimes things have just run their course and it becomes time to move on. Anyway, on to the long story. Having been born and raised in Indiana, John Cougar as he was known in the early days was a musical hero for me and I have followed his career in music since the start. He is the “Elvis Presley” of Indiana. He went through the New York and California stages and decided to come back to Indiana because he liked the “small town” life for raising a family and it just suited him better. That combined with the fact that you would never know by appearances that he was the multimillion dollar powerhouse that he is, is what led me to try my hand at becoming a “stalker”. The Rolling Stone magazine ran an article about him and his life in Indiana back in August 2008. After reading the article I decided to try to approach him about my “Muscle Car” idea. So after a few hours of internet searches and map searches, I decided to drive to Bloomington, Indiana to talk with him. Now, I live north of Chicago, Illinois so while on the map it is mere inches apart, it is actually about a 6 hour drive one way. The PT Cruiser was gassed up and the mission was commenced on Labor Day weekend…Sunday. The drive is nice and while I can skip details of that, the end result was that after bothering his neighbor since I had picked the wrong driveway to buzz the gate, I finally located the correct address. It was a waste of time. No answer, and I remembered that a few years prior when I was vacationing at Hilton Head John and his family had also been there at the Holiday Inn at the same time, so quite possibly they were out-of-town for the weekend. My bad. With the 6 hours invested in the trip, I did have a backup plan, just in case. That was to see if his friend and band mate Mike Wanchic would talk to me and possibly pass on some information I had printed up for John. I did find Mike’s house on the first try and he was home. We had a conversation in his driveway and afterwards I felt pretty good about what I wanted to do and that I had possibly made a connection that was going to get this deal rolling. 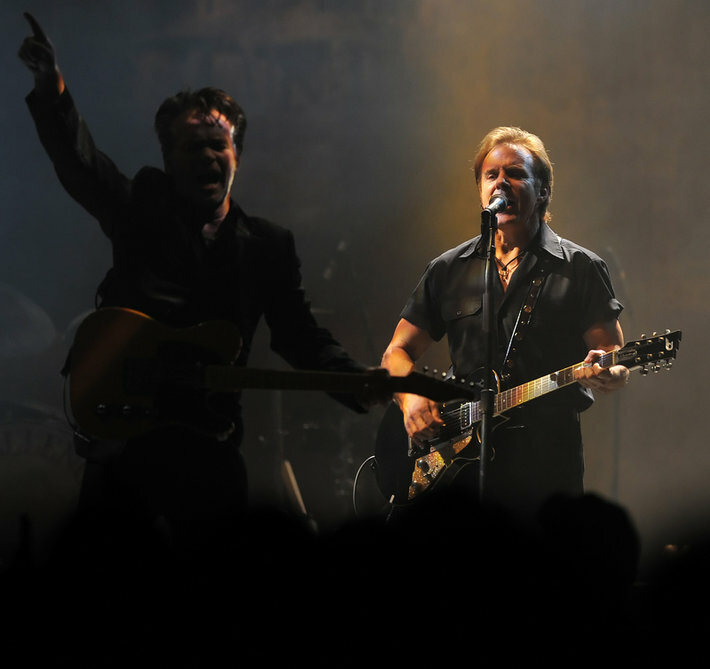 The photo credits belong to Matt Detrich/The Star and this is Mike Wanchic playing with John Mellencamp at the Hinkle Fieldhouse at Butler University on November 11, 2010. When I met Mike he had much shorter hair. Anyway, the point is that while I do not know if Mike passed on the information or not because neither John or anybody else has ever gotten in touch with me, I am still plugging away at the Muscle car game one car at a time and still trying to get the ball rolling. I talk with a lot of people over the course of a year, and I do try not to be a pest but I am sure I am one anyway. The whole point of this post is that while my dream may be silly to most and most of the time it seems as if it is a huge failure, you have to do what you believe in. With the New Year comes our New Years Resolutions and while most of us will not keep them or will fall flat on our faces, it is what helps drive us and makes us who we are. So while I keep plugging away at searching for my illusive “investor”, you should all be moving ahead towards your dreams as well. We have another year beginning and while we are not getting any younger, you cannot let your dreams die. Push on and keep trying, because sometimes dreams can and do come true. Just a short posting this time. It is Christmas Eve, so I have a lot of stuff to accomplish before the day is over. This time I have decided to give those who care my current “Christmas List” of vehicles. Just in case anyone out there cannot decide what to get me. 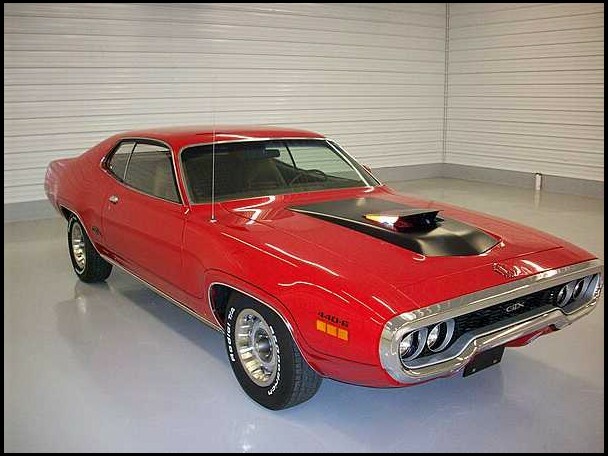 First we have the 1971 Plymouth GTX. Make sure it has the 440 and preferably the 6-Pack carb setup on it, but in a pinch, and since this is short notice the 4 barrel setup is also acceptable. 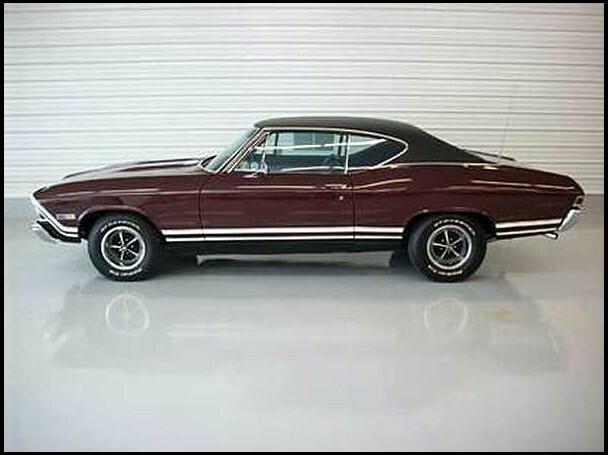 The 1971 GTX was a new body style that had some added style to it compared to the 1970 with its slab sides and box styling. 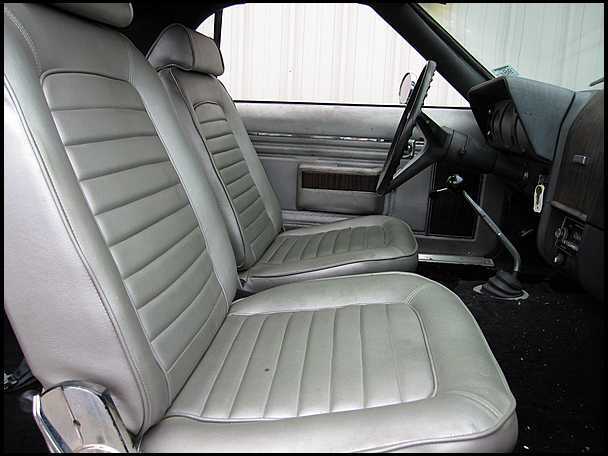 It should be a bucket seat interior with a 4 speed transmission as well. Don’t bother with the A/C option because when the temperature is 90 degrees or over, it won’t be driven since these Mopars are notorious for running hot in hard-driving. What’s the point in having to sit in a parking lot waiting for the engine to cool down ? The version here also has an Air Grabber intake hood and air cleaner which makes it cost a few thousand more. But I never claimed to be a cheap date. These are not in any prefered order so any will be a fine choice for me. Next we come to a 1969 Pontiac Firebird 400 Convertible. It has to be a convertible because this one will be driven in hot weather also, unlike the GTX. Automatic transmission is also okay for this little screamer. The Camaro SS/RS with a 396 can be substituted, and those are more plentiful but will cost almost double or even triple what a Firebird will. Just trying to save you some cash people. Then there is the 1970 Mercury Cyclone with the 429 Cobra Jet engine. There are several upgrades that can be added to the Cyclone. It could be a “GT” model or the “Spoiler” model and any will be fine with me. 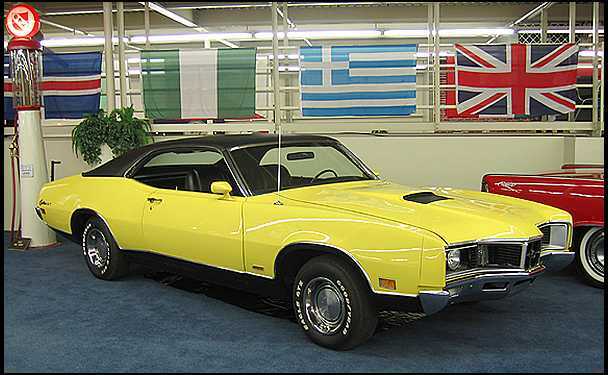 The Cyclone was based on the Montego model which was based on the Ford Torino, but the Torino never had the cache that a Cyclone did with the Muscle Car Crowd. This is a vehicle that looks good in almost any color, whether it be Baby Blue, Yellow, White, Black, Blue, Red….it really does not matter. For any “High-Rollers” that are out there the next choice will be up to you guys to buy. 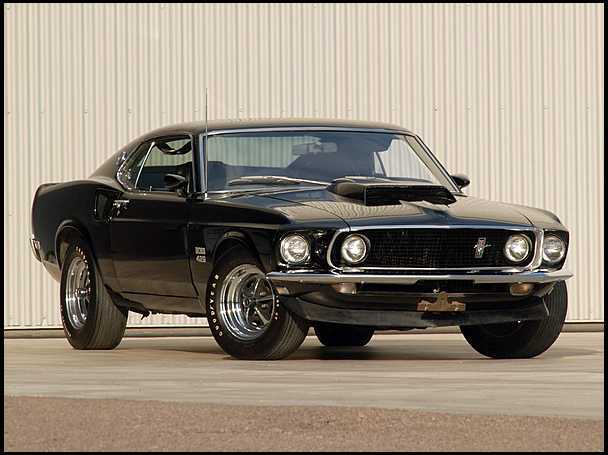 That would be the 1969 Ford Mustang Boss 429. This car will set someone back $150,000 or more. I refer back to the “I am not a cheap date” quote from earlier. This is the closest car to a factory built NASCAR vehicle you can find, even though the Mustang was not used in NASCAR. Several tricks were used to actually make the heavy engined vehicle better balanced such as wider front suspension geometry and relocating the battery to the trunk and much beefier suspension up front. This would be an under 90 degree driver as well as the GTX. But that is what I will have to deal with and it is a challenge that I will gladly accept. The Boss 429 was made in 1969 and 1970 so either will be fine. For those who want to get me the 69 or 70 Mustang but cannot quite afford the price of a “Boss”, I will accept a Mach I with the 428 as well. Here we have the 1970 version with the 428 Cobra Jet engine. While only 1 cubic inch smaller in displacement it is about 100 horsepower less as well, due to the special pieces in the 429 Boss engine. That is alright with me because it is the thought that counts when someone buys me a gift. I can still wreak havoc on the city streets with the Mach I. 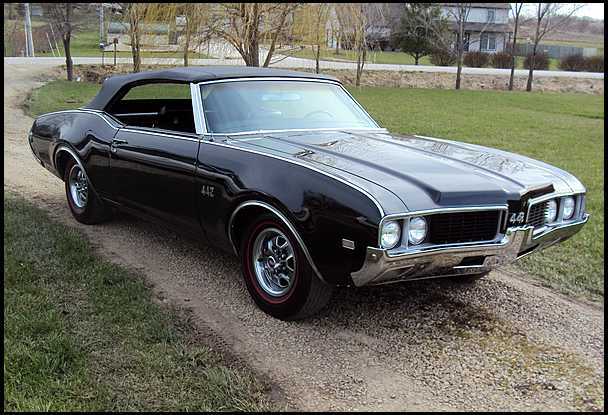 The final choice for this list will be a 1971 Oldsmobile 442. Preferably a convertible. Automatic transmission is fine with me and although this is a 1971, I will take any year from 1969 through 1971. The version here is the W30 model. The engine is a special motor built by Oldsmobile with special heads, carb and exhaust as well as major mods to engine internals. 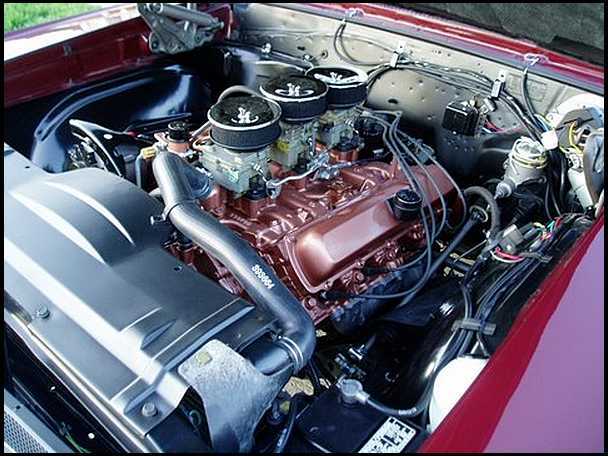 This engine along with the Buick 455 used in its GSX have the distinction of having the highest torque of any engines built during the Muscle Car years. 500 foot pounds of torque was the claimed number and nobody else cracked the 500 mark back then. So anyway…..that is my list. Everybody have a safe and joyous Christmas and enjoy some time with your families. God Bless all of you and thanks for following my blog. For those who may be new to the idea of buying a classic Muscle Car, I am picking a few cars that should sell for around $20,000 and could possibly go a little higher. But based on the current economy and what recent auctions have done, I feel the at the $20,000 ceiling should be adequate. 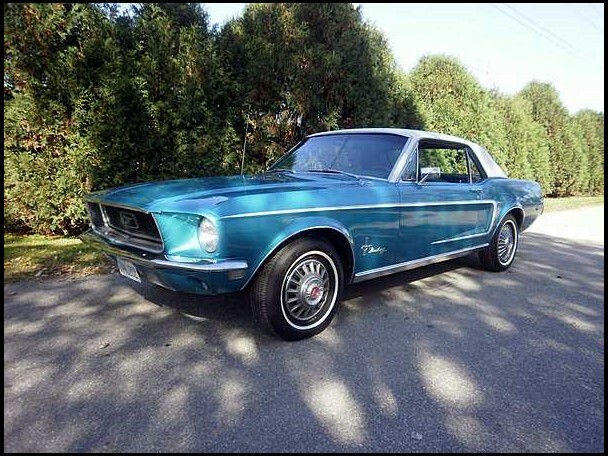 The blue car here is a 1968 Mustang with a 289. This vehicle makes for an excellent starter car due to the fact that with over 2 million Mustangs built during the Muscle Car era, parts are plentiful and inexpensive compared to most of these “dinosaurs”. Mustangs are small in size and fun cars to drive and even a little V-8 can really perk them up. The 289 is the engine that later became the 302, or as commonly known today the 5-0. 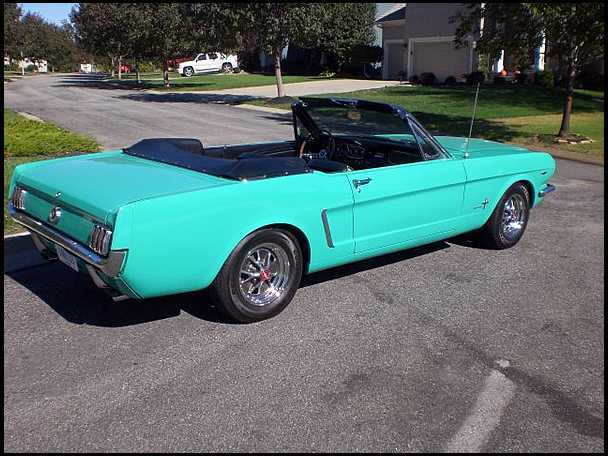 The light blue convertible would be a 1965 Mustang. Once again it has the 289 and this one is also a convertible so top down wind in the hair enjoyment comes with the price. Early Mustangs are plentiful, so even though a convertible can double or triple the price of the average collector car, that rule does not apply to Mustangs. Expect no more than $25,000 to become the owner of this little gem. You never know if a collector is looking for a specific car in a particular color so should any of you actually try buying a vehicle I show here, remember my pricing should be used as a guide and if bidding goes crazy your best bet is to pass on the car, because the prices I quote are realistic. Most collectors will end up overpaying for a car that they deem special to their collection, and they usually do not buy cars to sell them right away so if they end up $10,000 over value, they know they will make that back eventually. 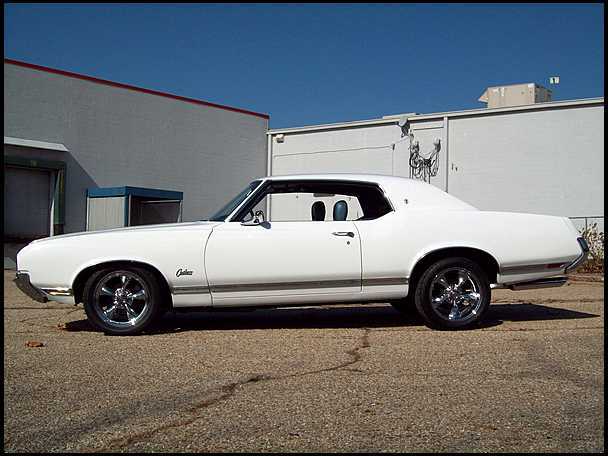 The next car is a 1968 Pontiac LeMans with the 350 engine. Once again it is a convertible. Most people use the LeMans to build GTO clones and trying to find one in good condition that hasn’t been converted or relabeled as such can be difficult. As a rule the LeMans would go for around 15-18,000 dollars. In Hardtop form. A convertible can tip the $20,000 range. This one should end up around $26,000 as a maximum. Anyone who has read my blog postings would know that I have the utmost respect for the Chevrolet Nova due to its tremendous performance potential. This blue beauty is a 1968 with a 350. The owner has invested $30,000 in it to bring it back to what you see here. The shame is he won’t get that back. His overdoing it will become someone else’s prize. With the 350 it won’t pull wheelstands but then it is plenty of engine to pull this little car around town on cruise night in the summer. And the 350 from Chevrolet has probably more aftermarket parts than any engine ever made, so keeping it running will not be an issue. Expect a top price of $24,000, and really it could end up around $20,000 even. The white car is of course a 1970 Cutlass Supreme from Oldsmobile. These like the LeMans usually end up being cloned into real Muscle cars. In the case of a Cutlass that would mean labeling it as a 442. Unlike the GTO this entails more than just buying badges. The Supreme would not be a body that lends to cloning since it used the square top rear quarters, whereas the 442 used the rounded top “S” rear fenders, except for the convertible versions (they used the Supreme body). 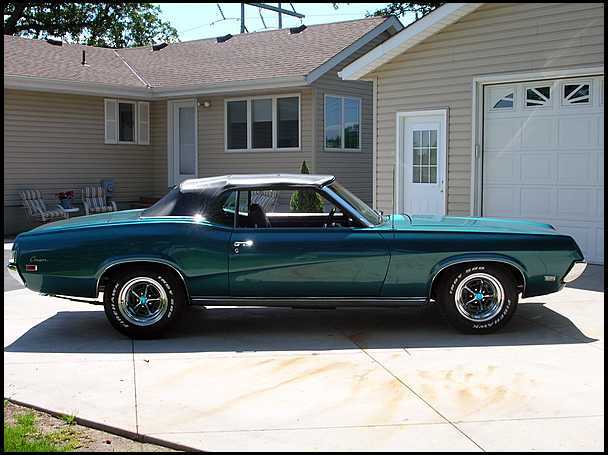 Still the Cutlass and the LeMans and the Buick Skylark as well as the Chevrolet Chevelle were arguably the best looking intermediates built during the era. All used 350’s from their division as a base V-8 and you could option a big block 400 and later years the 455 or 454 engines. The 350 with a 4 barrel carb smoked the tires. The 400 roasted the tires. The 454 and 455’s just plain spun the tires untill the rear end was used up or the driveshaft broke free from under the car. While Chevrolet and Pontiac tried marketing towards the young crowd, the Oldsmobile and Buick vehicles mentioned here were more the “Gentleman’s” Hot Rod. And many people mistakenly thought that they were not as potent. This Cutlass should go for around $20,000 with a top run of about $26,000. An American Motors Javelin with the 360 is next on the page. This is a 1971 model. One does not normally think of AMC as a muscle car company, but during the 1960’s and early 1970’s, all the American car company’s with the possible exception of Cadillac and Lincoln had a model or two at the minimum for performance minded consumers. The Javelin was the basis for the AMX which was basically a shortened Javelin with no back seat. 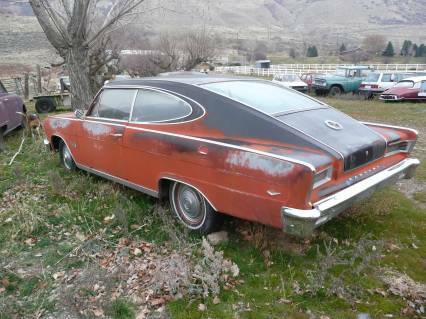 AMC also had the Rebel “Machine” which eventually morphed into the Ambassador (not the Coupe). AMC did not sell the volume of cars that the Big 3 of Detroit did, so their engines and transmissions were a lot of times versions of Ford or Chrysler products. This makes parts compatibility possible but some of the engines do not share parts with their more popular brethren. Check for parts match if you want to build up an AMC. Because of this the AMC performance models do not have the higher price tags of their competitors. This beauty should sell for $24,000 at best. Then we come to what could surprise even me. A 1972 Dodge Dart Demon with the 340 engine. 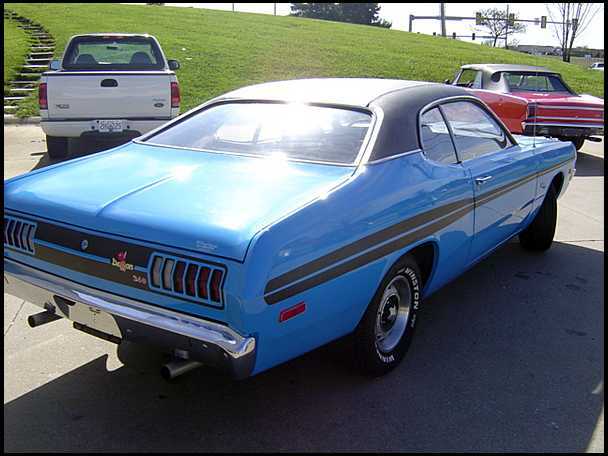 Beautiful car with a bucket seat interior and the Mopars are among the hottest cars from the Muscle Car Era. They set records every year with the original Hemi engines monsters. This is not one of those and should sell for a reasonable $26,000 or less since it is a 1972. Technically the Muscle Car Era ended with the 1971 Models, but Mopar still was offering 440 engines and performance packages into the late 1970’s when their Corporate mandate was to use the 400 cubic inch “Lean Burn” engine as its top choice except for trucks and vans. Well hopefully this will give someone a little help with getting into the Muscle Car Hobby. All these cars will be in Kansas City for the Mecum Auction and it starts TOMORROW. Kind of short notice, but that’s how it goes sometimes. I apologize to everyone for not doing a report on here for a while, but hopefully I will have time to give more timely, regular blogs in the future. One of the areas with the highest potential for increasing their value would be what are considered the “fringe” vehicles. 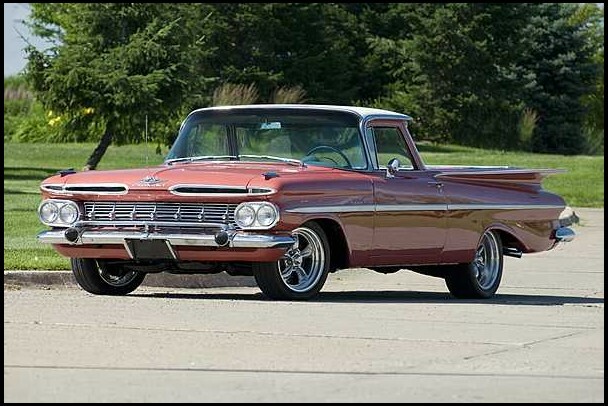 Examples like this 1959 Chevrolet El Camino would fit into that corner of the collector car market. This would be an extreme example since it is before the “Muscle Car Era” started. 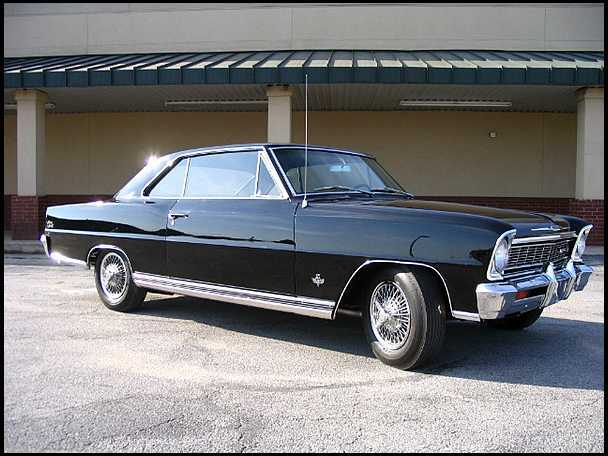 The version shown here was based on the Impala or the Biscayne model line and therefore not an intermediate per se. Other fringe vehicles would include the Mercury Cougar. This one being a 1969 with a 351 Windsor small block. The “Cleveland” did not reach production untill the 1970 model year. This is a discussion I have had many times before with guys who are supposed to be knowledgeable in the field. 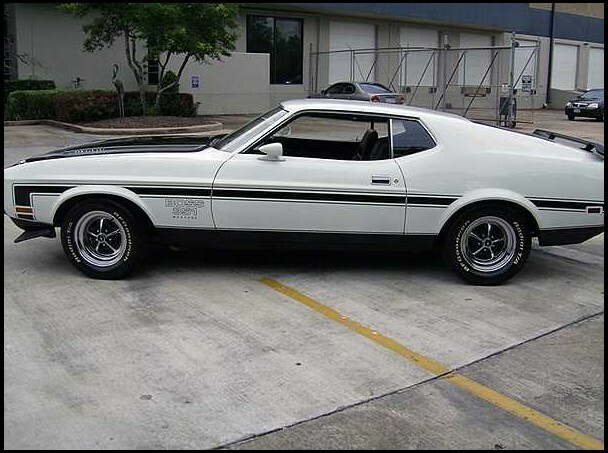 The Cougar was marketed as a personal luxury coupe to compete with the segment that included the Riviera, Toronado and eventually the Monte Carlo. As far as sales go it was not very competitive, but with the right options it could compete with some of the lesser Muscle Cars at the time. The Dodge Charger as this example from 1969 shows was very much a muscle car and its 440 cubic inch big block engine was only outdone by the 426 Hemi from Mopar. Although it lacked a few cubic inches when compared with the 455 and 454 engines from General Motors. The big difference was that Mopar was installing this beast into intermediates long before General Motors lifted their 400 cubic inch corporate limit for intermediates in the 1970 model year. GTO’s and 442’s and Chevelle’s and Gran Sport’s had to do with their 389 and 400 and 396 engines while over at Mopar you still had 2 options above them to choose from. This is one of the reasons why Mopars are among the most valuable collector vehicles. While there are a lot of Chargers still around the model year of 1969 is among the most sought after due in small part to the “Duke’s of Hazzard” who’s General Lee is probably one of the most famous cars of all time. 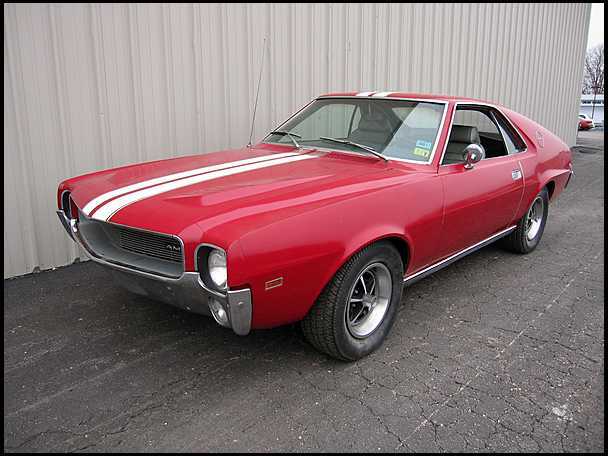 This 1969 American Motors AMX with its 390 big block is another example of a vehicle that while not at the top of the food chain in its time is sought after today. The Javelin it was based on was equiped with a back seat while the AMX version was shortened and did not have a back seat, but rather a “package area”. 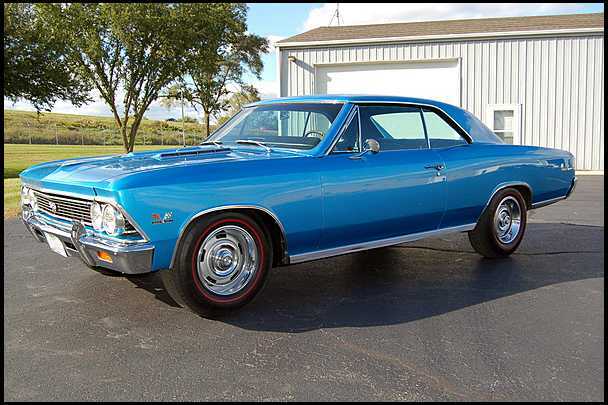 The early models of the Chevelle are also climbing in value a little ahead of the curve. This is a 1968 138 series which is a SS396. But the models with the 327, 307 and of course the 350 small blocks are being bought and restored as well. Later versions of the 396 actually used a 402 engine despite being billed as SS396 models due to the popularity of the engine. The change was due in part to the blocks having scratched cylinder walls and needing to be rebored by the factory, or so the story goes. Not everything said by General Motors was as honest as you would have believed during their attempts to get around “Corporate” rules restricting their engine selections. 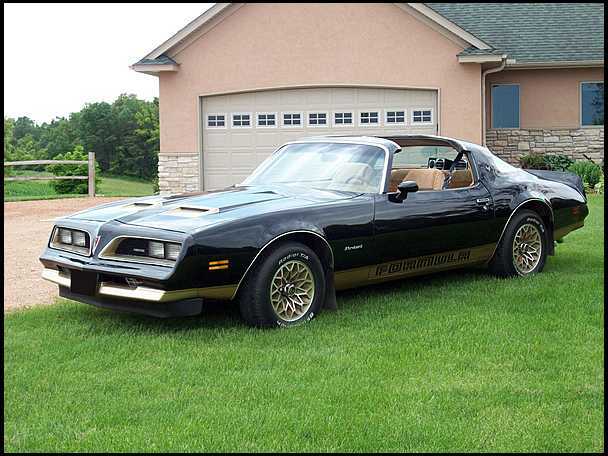 This 1978 Pontiac Formula is another example of vehicles that are choices when you start looking for cars to invest in. The Trans Am was bona-fide “BIG DOG” of the Firebird group but the Formula was an equally impressive car with slightly more civilized manners. 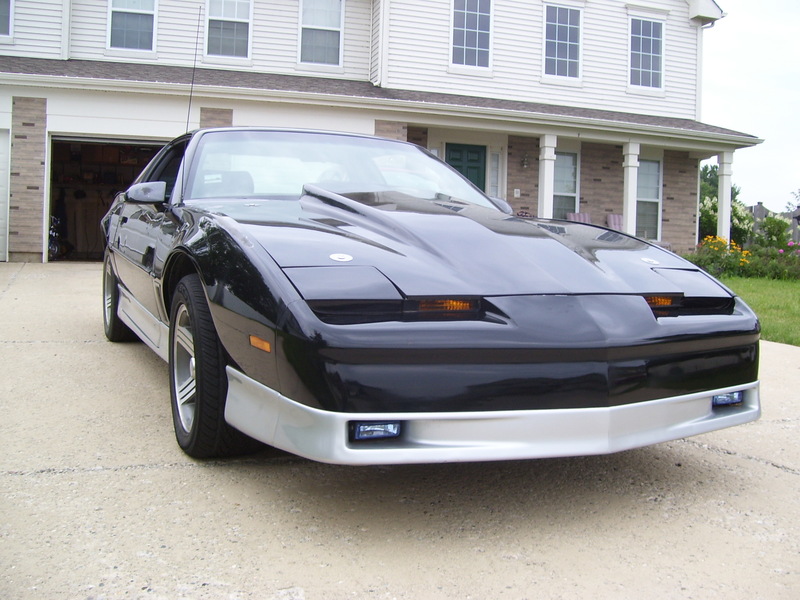 The Pontiac division was probably the last Detroit carmaker to give up on the Muscle Car as the Trans Am continued being the fastest thing other than a Corvette, that you could buy from Detroit. Even though these later vehicles were smog controlled and detuned versions of their former selves, in their time they were the best you could hope for. And due to this most “collectors” will always have at minimum a Formula in their collection if not a T/A with the 455 HD motor. So besides the obvious choices from 1964 to 1971 model years there are many choices for you to look through when it comes to picking a car for an investment. 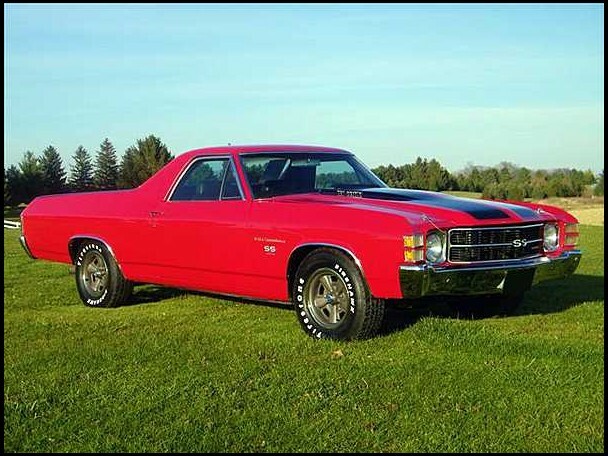 This 1971 Chevrolet El Camino SS454 is an example of what the final year of the “Muscle Car Era” had in store for buyers. When you decide what manufacturer you prefer then you start looking through their lineup and based on what you have to spend, you should be able to find something, either an actual muscle car or a fringe vehicle. Sometimes the choices are overwhelming because there are literally hundreds to choose from, but if you are not in the market soon you will find it much more expensive in the future to get in. The values on some of these cars will nearly double in the next 2 or 3 years and no matter what they will probably outpace the rate of inflation. So my advice would be get off the couch, and either get logged into the internet to start searching or go out to your local car shows and see whats around. Someone always has someones dream car for sale. And you don’t want someone else getting yours now, do you? 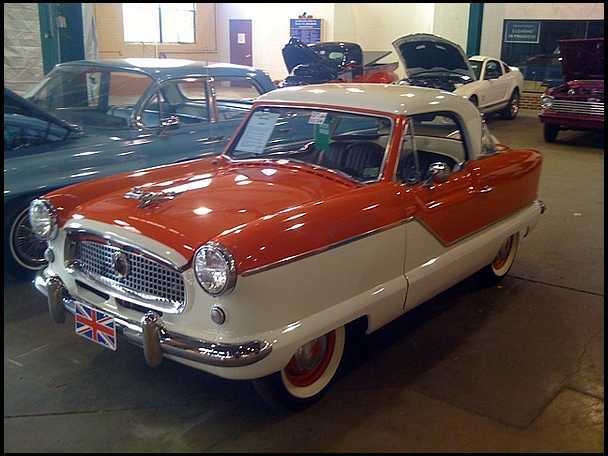 Well, the little Nash Ambassador sold for $14,000 which is a little low for usual pricing, but not too bad. Nice addition for somebody. These are usually under the $20,000 range so they are comparable with the BMW Isetta from the same era and are similar in that they are ultra small and quirky cars. Check past blogs of mine for a photo of an Isetta. There was also a 1960 model that sold for an even lower $9100. This was that car. Must be something in the water in Minnesota, or maybe there is something in the water everywhere else. Either way people in Minnesota seem to have kept these little jewels in pretty good shape and then spent money to restore them. Then we get to an actual Muscle Car. This is a 1966 Pontiac GTO with it’s original numbers matching 389 big block engine. The owner had upgraded the engine with a tri-power setup. To top it off it is a red convertible and it sold for a measly $30,000. Nice addition for someone since it should sell at a dealer for somewhere in the $45,000 neighborhood. Then we come to what may have been the best purchase of the entire Auction. This white beast is an actual 1971 Mustang Boss 351. 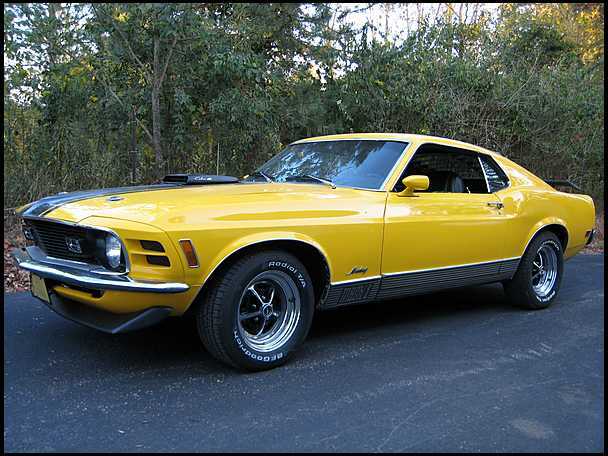 While only possessing a small block V8 engine, most people would assume that the Mach I from 1971 with the 429 big block would be preferred over the lowly 351 Cleveland. Most people would be wrong. This is no ordinary 351. The Boss engines were hand assembled with very special parts and were actually factory built race engines. Part of the reason for their low production was that since Ford lost money on every one they built, the factory did not promote the cars in their advertising very much. The Boss 351 Mustang actually beat the 429 Mach I in a quarter mile drag strip comparison run by a car magazine at the time. Maybe similar to the comparison of the 440 from Dodge beating a Hemi 426 at the strip. The 440 holds it’s own and can win a quarter mile run but when you get past the slower start the 440 will NEVER catch a Hemi 426 once she catches her breath and starts into it’s horsepower curve. I have seen Boss 351 Mustangs selling for 40 to 50 thousand dollars. This one went SOLD for the sum of $22,500. NICE DEAL. Well, needless to say I did not buy the Allante. Very nice car and all, but trying to stay focused on my mission. Now that the weather is nice it’s not that easy to do. 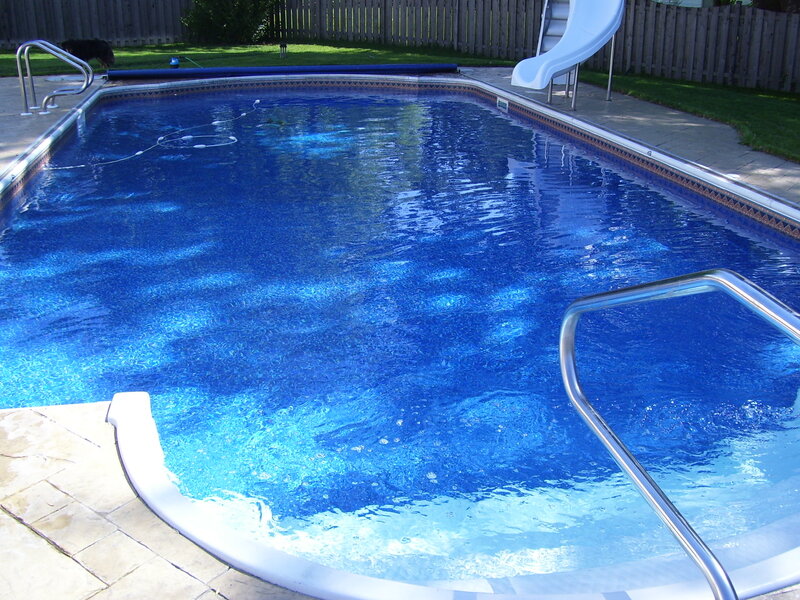 Spent most of Memorial Day weekend around the house and taking advantage of the pool and the hot weather. Got the water crystal clear and although I did have to use the heater to get from 78 to 83 degrees for temperature, it was worth it. By the end of the month of June the heater will be idled until probably late September or October. I usually run till Indian Summer kicks in around the middle of October but last year has made me rethink that strategy since I wasted heating the thing for basically nothing the last couple weeks of the season. The “Car Season” is in full swing and at Volo on Sunday last weekend there was a decent crowd I thought. I took my brother-in-law Joe with me and we went through the “Car Corral” then went through the cars Volo has on display in their labyrinth of buildings. Several decent cars to choose from depending on your budget, and I recommend anyone in the market to check their website for what is available. They have recently started really promoting their consignment cars and have quite a few on the website that are not actually at their facility. This brings in an added wrinkle for me because now I have to figure out if a vehicle on “consignment” is local or not. Not really an issue but then again, you want to actually see the car in person. The next Mecum Auction is in St. Paul, Minnesota and is coming up fast. This is one of their smaller field of cars but there are some vehicles of interest. Several vehicles came up in my search of the listings which I hope to get to in the next few days. Seems to be a few 1955-56-57 Chevy’s for the guys who appreciate those also. Volo’s site is www.volocars.com in case anyone wants to look through their inventory. Mecum’s site is www.mecum.com for anyone who wants to check their auction listing. I do recommend you becoming an “Infonet” member so that you can see what these cars sold for in the past auctions. Well, that’s it for now. Stay in the sunshine and talk at you all later. First off I apologize to anyone who came back hoping to read an anecdote story about my past life. This week I have returned temporarily to the Muscle car sales theme that has prevailed in this blog from the start. Mecum Auctions are/were in Kansas City for a big Auction and there were a lot of cars that sold. There were many that to the trained eye were what are know to the masses as “money in the bank”. Most of the sold vehicles went for reasonable money and yet there were probably 30 that sold for well under what a good dealer would sell them for. These are the vehicles that people like me look for and try to buy to resell for a living. These are cars that can net someone a nice $10,000 or more profit if you shop right and do your homework. In an effort to both educate the novice among you and to show my own ability to spot a bargain, I will share a few of these actual cars with you. First up would be a car that here in Chicagoland is almost impossible to get ahold of. 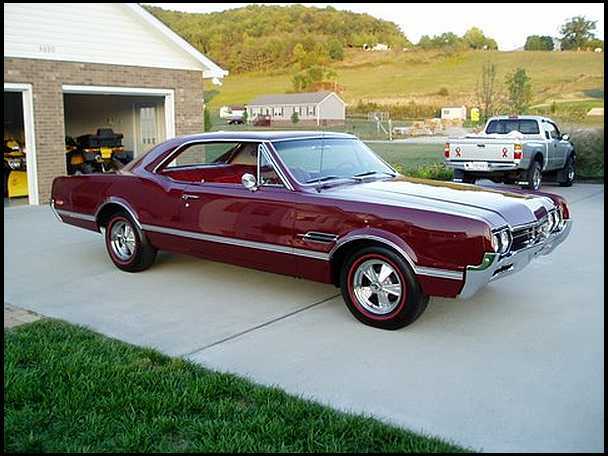 A 1968 Oldsmobile 442 with a 400 CID engine and in really good condition. Add the fact that it has the bucket seat interior and wood rim steering wheel and the Ralleye wheels and she is a numbers matching car. Rough estimate would put it somewhere around $35,000 to $40,000 range, IF you could find one. Want to know how much someone actually paid? $17,000. Yes, my friends….someone managed to pick up a car worth double the money. And this was not the only one from the sale. There are several companies that deal with Muscle cars and run auctions. One of the best is Mecum. They seem to be able to get sellers to lower their reserves enough to move a lot of bargains across the staging area. Some companies seem more intent on helping the seller. And I understand the seller is who lists the vehicle with the company of his choosing but if it doesn’t sell there is no commission. There is a listing fee that the auction house gets but the sellers commission is what makes the auction house their money. So, no buyer and no sale then no commission. Being the buyer, I like this type of thinking better, anyway. 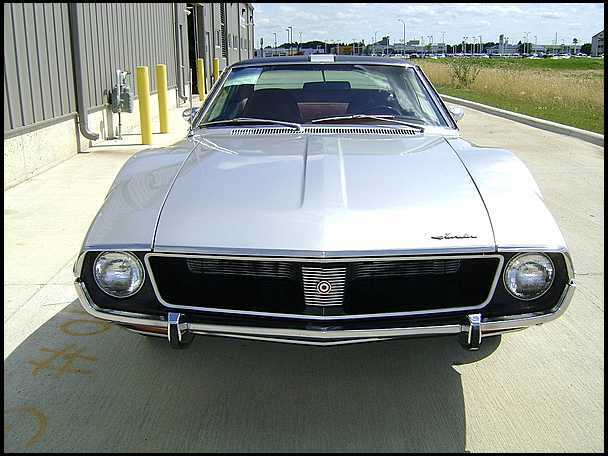 Then there was a 1969 AMC AMX with a 390 and a 4 speed manual transmission. Red with a silver vinyl interior. A very nice “driver” car. Something you can actually take out for a cruise on the weekend and not be afraid of putting a few miles on. While I benefit from my proximity to Kenosha Wisconsin and the fact that this area has a rather high AMC fan base due to the fact Kenosha was home base for AMC, this vehicle that sold for $16,000 would bring from $25,000 to $30,000. So, while not double your money, it comes close. And sometimes close is nice, too. 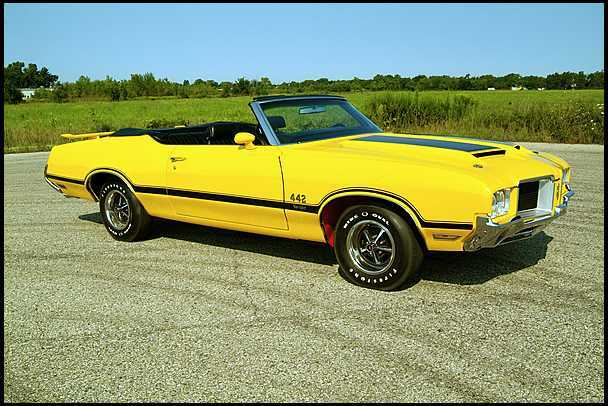 Next we have a 1969 Oldsmobile Cutlass 442 convertible. The 1969 convertibles used the “S” body for the convertible. 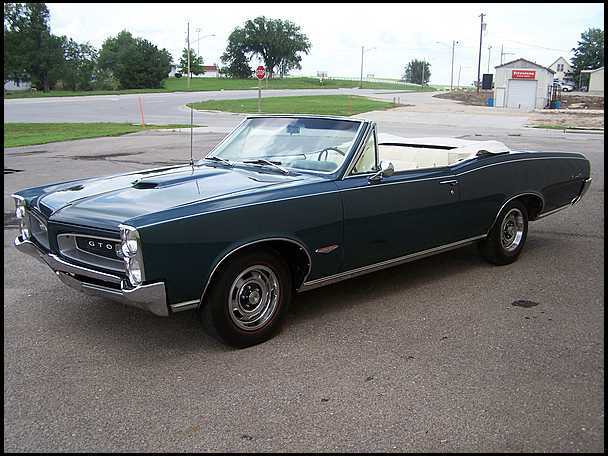 Later years even the 442 convertibles used the Supreme body style with its squared off rear quarter panel tops. This was despite the fact the Supreme body style was not used for the actual 442. This convertible would sell for around $40,000 and it went out the door for $23,500. Nice little profit for someone to make and it’s value should climb actually ahead of the majority of the Muscle cars due to the huge following these 442’s have. 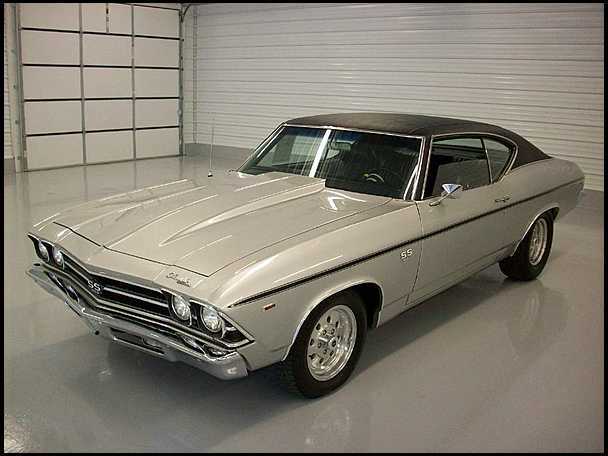 The 1969 Cortez Silver Chevelle SS396 is another GM that has an amazingly huge following. There is a guy who lives just a few houses down from me who owns a landscaping company that has a matching his and hers set of 1971’s. His is Blue – hers is Red….or maybe it’s the other way around I don’t know for sure. Anyway it seems like the Chevelle is similar to being a Ferrari guy. You don’t own a Ferrari- you collect them. The same seems to be true with Chevelles. A tow truck company owner I know also has 4 or 5 of them. This silver SS396 version sold for 26,000 dollars and is worth probably close to $35,000 or maybe $40,000. So figure a 30% premium there. Not too shabby. 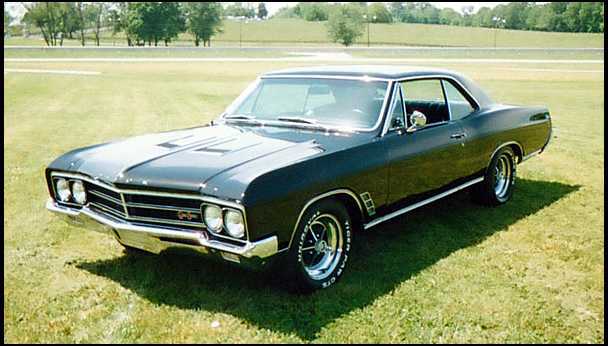 Next vehicle is a 1967 Pontiac LeMans. It is not a GTO. It has a 400 engine with the tri-power carburetor set-up like the 1966 and earlier 389 GTO’s had. This was not a factory deal. This is something the vehicle owner did to make it unique. The car is a convertible and that makes it more valuable than just a hardtop. It sold for $23,750. The guy who owned it did not do the usual clone job and did NOT put GTO badges on the vehicle as would normally have been done. He was not trying to make a clone, he just wanted the GTO experience without the price tag. 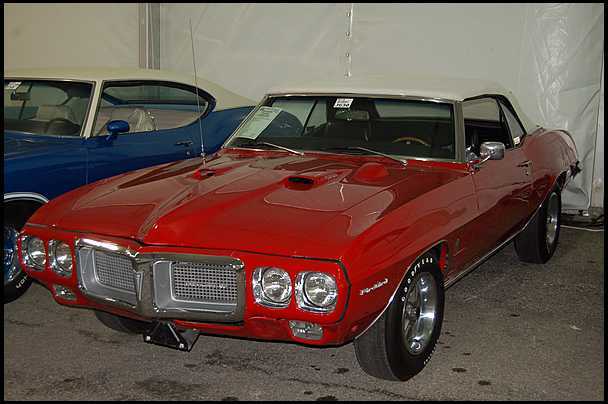 A true GTO convertible would have set him back in the neighborhood of $45-50,000. A Real Estate salesman in my subdivision has a GTO clone that he has paid over $40,000 and it’s a hardtop with the LeMans tail lights not the slotted GTO blinkers that tells everyone what is real. This car is more difficult to figure a price on, but I would say it should fetch $35,000 from the right person fairly easily. Anyway, before I run into a blog entry that resembles a draft of War And Peace…( way too long )…I should wrap this up. The point I am making is that Auctions present some very good bargains and they are an excellent source for finding vehicles. The major Auction companies spend enormous amounts of time and money checking documentation on vehicles and making sure that they are presented as what they actually are. And while you can find everything from totally restored better than new cars you can also find daily drivers and unrestored vehicles. And if you arm yourself with the knowledge, you can really make or save yourself some cash too.